When did the holidays turn into an excuse to go crazy with candy and sweets? 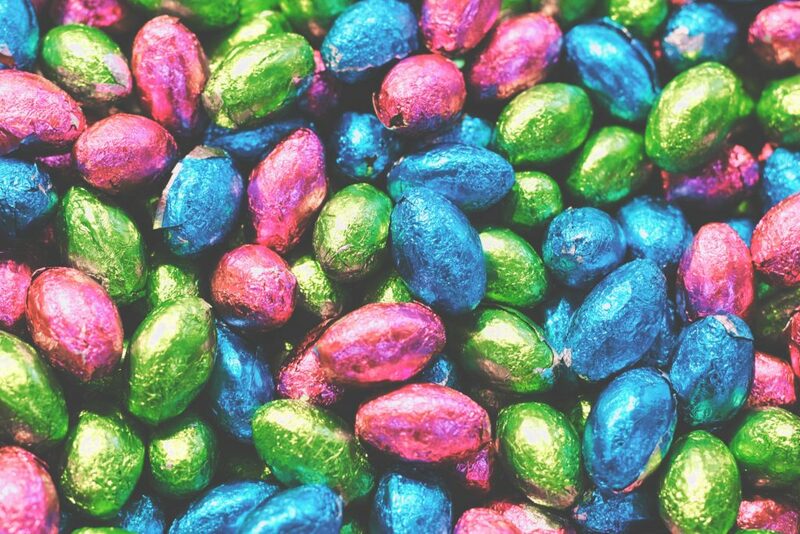 Every grocery stores goes from holiday to holiday repackaging chocolate and candies with red for Valentines, pastels for Easter, patriotic colors for the summer, orange for Halloween, then red and green at Christmas. Same candy, same sugar high, different color. When I was a kid, I got a single chocolate Easter bunny! One. And, at Christmas, we got stockings full of fruit and nuts (and maybe a single candy cane or two)! I can’t take it any more. It’s not fair to the diabetic in our house that everyone else gets piles of candy, and he gets sugar-free gum. So, this season, we’re all going low-sugar for Easter! One candy bar or bunny each – everyone gets their favorite. Then, we are going to fill baskets for the kids with the things they need for spring and summer — new flip flops, goggles for the pool, some new chalk or bubbles. For big kids, we’ll do a few low-carb grab and go snack packs, some new sunblock sticks, a box of new golf balls, a pair of new sunglasses. Fun, practical, and sugar-free Easter for us. Who knows, maybe we could even focus more on the reason for the season?? Happy Easter everyone.